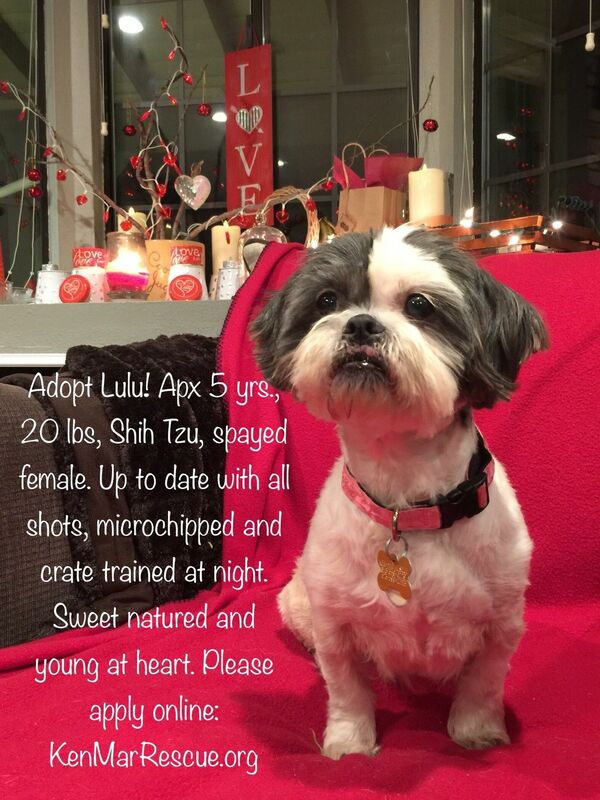 Adopt Lulu the Shih Tzu Wonder Dog! Who We Are Ken-Mar Rescue is a non-profit organization founded in 2007. Our dogs are rescued from pounds & from various situations of abandonment, neglect & cruelty. While in our care, each dog is given the love & attention they need to be adopted into a new permanent home. Each dog is sterilized, shots brought up to date & other medical treatment as needed. All orphans are groomed, well fed, exercised & socialized so as to prepare them for adoption. We have found homes for hundreds of dogs. With your help, we can save more lives: 1. "Like" us: FaceBook.com/KenMarRescueFanPage 2. "Follow" us on Twitter: @KenMarRescue 3. Print and post our orphan bios wherever appropriate. 4. Ask your employer if they'd be willing to put Ken-Mar Rescue on their list of preferred charities & "employer matching" donations. Ken-Mar Rescue is a Los Angeles, foster-based, small dog rescue that adopts throughout Southern California and beyond. We survive on your donations to save lives (501c3 non-profit). Mission Statement: To provide the best experience to the lives we save and to help them navigate their way home using a blend of compassion and technology. Adopt a friend Please click this link to submit an Adoption Questionnaire online: http://kenmarrescue.org/adoption_questionnaire.html We want to ensure that all of our dogs go to wonderful, loving, new, permanent homes. We work hard to find the best home for each individual dog, to create a lasting âlove connectionâ between adopter and pet. To that end, all potential adopters are carefully screened through our application process. We ask an adoption donation for each of our dogs. Every dog is spayed or neutered, given vaccinations, microchipped, and provided with any other necessary medical treatment before they go to their new home. We deliver each dog personally, and conduct a home check with each adoption. You too can help save a dog's life!